We walk through the tall palms with torches, scanning the undergrowth for frogs, spiders and snakes. Our 12 year old son Tom is in his element, eagerly pushing ahead in the hope of spotting the ever-elusive red-eyed tree frog. I’m terrified that he is more likely to run into Costa Rica’s deadly viper out hunting frogs, the exotically named Fer-de-Lance. 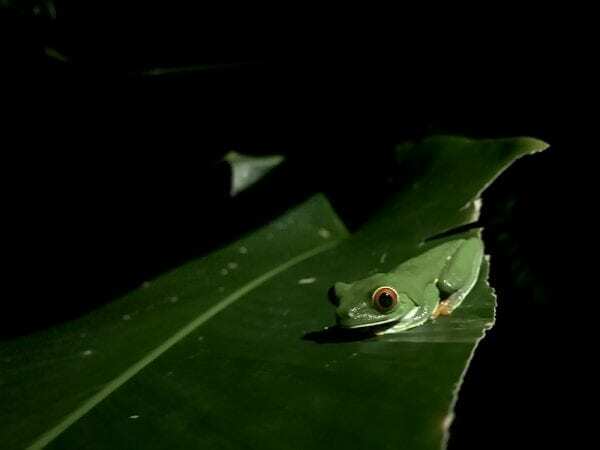 This journal is supposed to be about coffee but I couldn’t resist this brief description of our encounter with our first tree frog, a symbol of Costa Rica’s incredible biodiversity. Because of all the origins we have visited it is this county and people which have the best story to tell about protecting the environment. The story tracks back to December 1, 1948, when the then President José Figueres Ferrer abolished Costa Rica’s military after a bloody civil war. He symbolically smashed a wall with a mallet to mark the end of the nation’s military spirit and vowed to invest in education instead. Costa Rica has been spared the conflicts of neighbouring Guatemala and Nicaragua as a result and a relatively well funded state education system has seen literacy rates soar to almost 95%. A world class state education has raised the level of environmental awareness in Costa Rica far higher than even most First World counties. Heavily dependent on eco-tourism successive governments have established a system of national parks that now covers 25% of the country’s territory. Despite only having 0.3% of the Earth’s terra firma Costa Rica is home to 6% of the world’s biodiversity with 840 recorded species of birds in the country alone. The Corvocado National Park in the Osa Peninsular is the jewel in Costa Rica’s crown of natural reserves. The last remaining primary forest on Central America’s Pacific coast, Corvocado extends across an area of 164 square kilometres with just 1% accessible to visitors. Just getting to it is an adventure itself. We were the only three passengers in a single prop plane that bounced through the mountain thermals to land on in single strip runway cut into the jungle. We spotted 55 species of animals that we had never seen before during our short stay there, including sloths, howler monkeys, scarlet macaws and humpback whales on their long migration from Alaska. As well as habitat loss, the greatest threat facing wild animals is climate change. Desertification, flooding, sea level rise, the list goes on and few can now ignore the reality that we are already living with the consequences of a runaway CO2 rise. Here once again Costa Rica is ahead of the game in combating greenhouse gases. Green sources such as hydro, solar and geothermal power from volcanoes in the region now generate 98% of the country’s electricity. The country is committed and on track to be the world’s first carbon neutral country by 2021. Which brings in a roundabout sort of way back to coffee and the Aquiares Estate which we visited in February this year. Owned and managed by the inspirational father and son team Alfonso and Diego Robelo, Aquiares is a model for environmental sustainability. 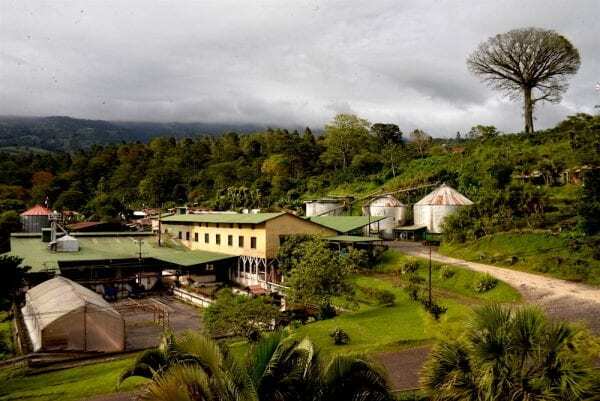 The largest rainforest certified farm in Costa Rica, in the past decade the farm has planted 50,000 shade trees, creating natural buffers around streams and water sources. This is encouraging a rich diversity of wildlife, such as our little red-eyed tree frog, back into Aquiares. In recent years armadillos, sloths, coyotes, squirrels and dozens of bird species have been spotted on the farm. 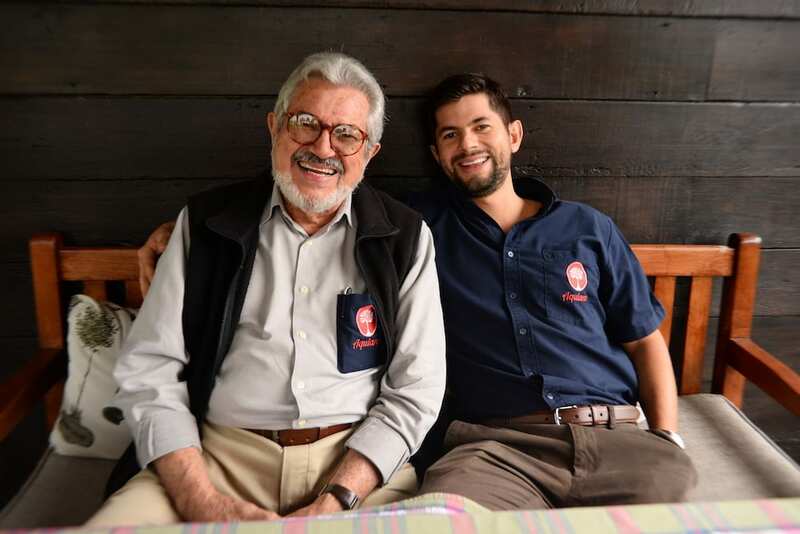 Innovation Manager Diego Robelo has now achieved a new goal: making Aquiares Costa Rica’s first carbon neutral coffee farm. It was no easy task with the first steps to somehow calculate just how much carbon is taken up with coffee production. His team produced a greenhouse gas ‘emissions inventory’ that calculated the use of petrol, biomass, fertiliser and other CO2 producing operations on his farm. He also worked with a forestry consulting firm to measure how much greenhouse gases are absorbed by fauna on the farm. Diego has balance his carbon books and his farm has now been recognised by stringent regulations set by the Intergovernmental Panel on Climate Change (IPCC) as carbon neutral. Hopefully Aquiares can inspire coffee farms and co-operatives around the world to maintain or adopt similar respect to the wider environment. Of course even then the journey of green coffee has only really begun. We have the same responsibility as roasters, café owners and coffee consumers to make the industry more environmentally, as well as socially, sustainable. Certainly, here at Glen Lyon we are looking at our carbon footprint and tomorrow will be planting 100 native trees in Inverness-shire with Trees for Life to help give back what we have taken. For me seeing that little red-eyed tree frog at Aquiares represented something that I can’t quite put into words. As a symbol for nature’s incredible resilience if you give it half chance. Or maybe more than that. A little manifestation of hope clinging on in the darkness.